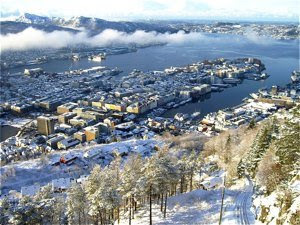 The best view of the city of Bergen is from Mount Fløyen, rising some 320 metres above the city centre. When staying there in November 2008, we had a very rare experience there, as we travelled into a winter wonderland. Why rare, you may ask? Because Bergen is Norway's rain capital, all year around also during winter. The western coast of Norway has a very humid and mild climate. Here you might find a few people having palm trees outside all year around, as the temperature rarely go below freezing. As low pressures are queuing up in the Atlantic precipitation falls by the meter - as rain. In November I left a cold Oslo, with no snow on the ground, to arrive during a strong blizzard. That weekend 20-30 centimeters fell in Bergen followed by strong winds. 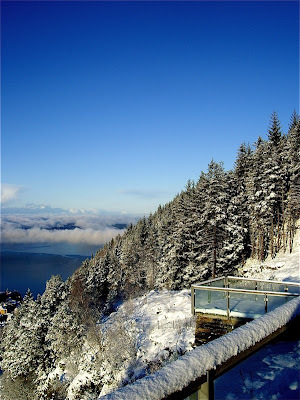 As I was joined by a good friend, we decided the next day to ascend Mount Fløyen by one of Bergens many great tourist attractions, the funicular bringing you from the city center up on the mountain. It is an awesome experience as the ride up is not for the fainthearted, as it ascends along a very steep rail with a few stations. 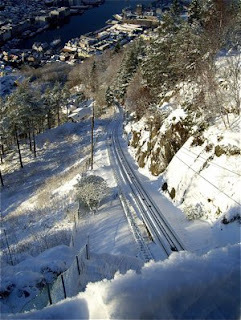 This as Fløibanen is not only a tourist attraction, but a part of Bergen's public transportation system, and people living in the narrow streets on the lower part of the mountain use it to get to and from the city. The rail line is exceptionally steep, and for those not very comfortable of heights, the trains have large windows so you have all the view you need. Once up you get an exceptional overview over Bergen. We certainly did, as the white snow reflected the bright white snow on the ground and the surrounding spruce trees. Small low clouds created a fascinating effect. From the plateau on Mount Fløyen we were able to see beyond the city as well, even getting the glimpse of the Atlantic outside. Being there, you may treat yourself with a cup of coffee, coco and a cake or an open sandwich at the restaurant. We chose a traditional Norwegian waffle with raspberry jam and sour cream. Certainly something to look forward to before you descend back into Bergen city centre. A trip up on Mount Fløyen is highly recommendable when visiting Bergen. I certainly got an experience I will never forget.